Seattle Cascades perform in the Georgia Dome on Saturday, July 29. What is your favorite drum corps story? In 2004, we had a guy in the corps named Tim who had taken a lot of Japanese classes in high school. At the time we were in Hershey, Pa., at Hershey Park. We all loved waterslides that year for some reason. We circled the park two or three times looking for a parking spot, and every time we drove past the water park, we would say, "Look! Waterslides!" And for some reason all of a sudden, Tim started saying "waterslide" in Japanese. Kind of dumb I guess, but at the time it was really funny. What is your favorite moment in your show? Our last impact is really cool where we have an amazing drum moment. Since I've been here, we've never had a big drum solo, and we have a whole movement of amazing drum playing that's really loud. It's really, really cool. What made you choose Seattle Cascades? 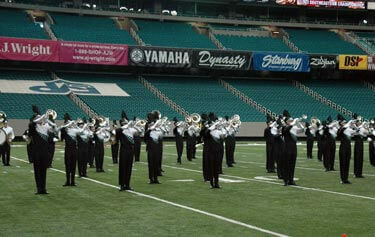 In 2003, when I decided I wanted to participate in a drum corps. I actually auditioned for a Division III corps first because they were the closest drum corps. I thought there was no way I could make the Cascades since they had just made the top 12 the year before. About a week before Cascades' auditions, I decided I might as well go try it out. Not only did I make it, I made it on the lead part, which was huge for me! I have stuck with it ever since. This last year was really hard because tuition went up, and I took a job I absolutely hated to be able pay for it. It was worth it, however, because there's nothing like drum corps. What do you miss most from home? My computer. I'm a computer engineering major, so I spend most of my time working on a computer. What were you most looking forward to before tour? I'm really looking forward to the free day we're having next week. After Allentown, we're going to Manhattan, which we haven't done in a couple years. It's a really awesome place to hang out. Anything else you want to say? I honestly can't think of anything right now. That's what a show does to you!